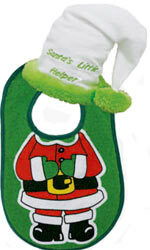 This Santa's little helper baby bib set includes a bib and infant white Santa hat for sizes 3-12 months. The green bib has the image of Santa's body, dressed in his traditional red suit, just below the bibs opening so that your sweet babies face is his helper. It is made of 100% terry cloth cotton with vinyl backing and an easy Velcro closure. The white baby Santa hat has a green fuzzy polyester cuff and pompom at the end, with the words SANTAS LITTLE HELPER embroidered in green stitching. It is also made of 100% terry cloth cotton. Please wash in cold water with mild soap and air dry. Such a cute way to out smiles on peoples face when they see your little elf!